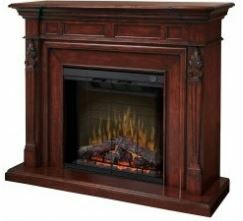 Description: Either as a focal point or as an accent piece, Dimplex fireplace mantels will make a statement in any room. Simply plug it in, sit back and enjoy your fireplace. A blend of technology, artistry and craftsmanship – the patented Dimplex® flame technology creates the illusion of a true wood burning fire. Hand-painted logs are molded from real wood logs for incredible realism. Many units also include the patented LED inner glow logs and pulsating embers technology or our next generation Realogs® which give the look of an authentic stacked hardwood fire. Dimplex® mantels are constructed of durable, cabinet-quality wood veneers to ensure long product life. Finishes are applied by hand during a multi-stepped finishing process for maximum quality. Our mantels come equipped with superior hardware that will last through the daily grind of everyday use. Our mantels come in a wide range of finish options to suit any style or décor. From the simple yet elegant black or white to a rich burnished walnut or oak finish, there is sure to be a finish that is right for you. Our wide range of style options makes it easy to choose the perfect mantel to fit within your home décor. From contemporary to traditional, each Dimplex® mantel brings a unique flair to your living space.